If you are searching for more Chutney Recipes then do check Curry leaves coconut chutney, Bottle Gourd Chutney, Mint peanut chutney, onion peanut chutney and Snake gourd sesame chutney. In a mixer jar, add the chopped tomatoes and onions and grind it to a puree. Heat oil in a pan. Add the mustard seeds and urad dal and let them splutter. Then add the curry leaves and hing and fry for a couple of seconds. Now pour the onion tomato puree and saute for a couple of minutes. Add the red chilli powder, salt and 1/4 cup of water to it and let it cook for a few minutes or until the chutney gets the desired consistency. Serve with idli, dosa or vada. My lookout for delicious and lovely looking chutney ends here. Excellent pics as well. Yum! I love tomato chutney. Looks great! 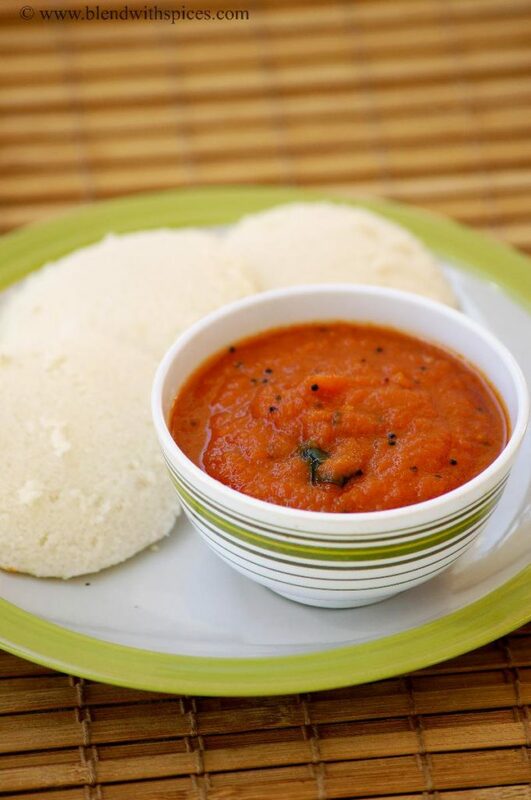 Idli and chutney look very inviting, perfect breakfast..